The women’s league 2017, which started a week ago, is in full swing and it was raining goals at the Changlimithang stadium in Thimphu yesterday. Playing their third match in the league, Druk United conceded 23 goals against Mandala FC. Druk United have been leaking goals in defence, conceding 13 goals against Thimphu City and 34 goals against Avalokita U-17 FC in their open two matches. It was yet another match to forget for the Druk United players as they suffered yet another heavy defeat. The players were no match to Mandala FC’s speed, skills and accuracy. Mandala FC scored with almost every shot on goal. The win takes them to fourth on the table leaving Druk United soul searching at the bottom. 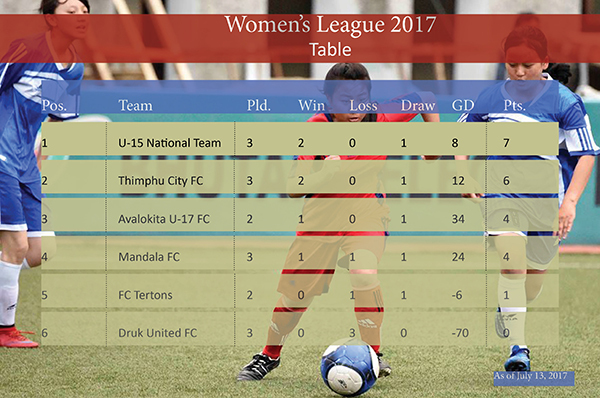 The Under-15 National Team is leading the league with Thimphu City in second place. Each match in the league is toughly contested but for the players, the league is much more than just a football match. “We can make friends and interact with different players. Apart from that, we are meaningfully engaged else we would be spending summer breaks at home,” said one of the players from team Druk united, Dechen Tshomo. Others also said league is perfect platform for them to showcase their talents. The women league not only has female footballers but also women officials taking care of the entire league game. All seven referees and assistant referees are accredited by football’s world governing body, FIFA. The league will end next month.